My BFF, Janice, makes an amazing breakfast quiche recipe that her whole family loves, so, inspired by her, I created my own version. And wow, is it GOOD! This Cheesy Spinach and Mushroom Quiche recipe is sooooo easy, and the end result is a beautiful, ridiculously delicious, mouthwatering treat. Though quiche is typically considered a breakfast food, it makes a wonderful dinner or lunch too. Though I chose spinach and mushrooms to use, you can really use any kind of vegetable you want. Also, I used a premade whole wheat pie shell for this, which I bought at Whole Foods, and it is excellent. However, I couldn’t find a good, low calorie premade pie shell, so this recipe came out a little higher in Points than I originally wanted. If you are crafty enough to make your own low calorie pie shell from scratch, then A. you are awesome, and B. It might shave off another Point or so, or allow for larger servings. Either way, it’s an incredibly healthy quiche that is still way lower in Weight Watchers Points than traditional quiche recipes. This dish is a must try! Start your morning off right with this amazingly delicious and healthy breakfast quiche. Full of fiber and protein, it’s filling and very tasty. 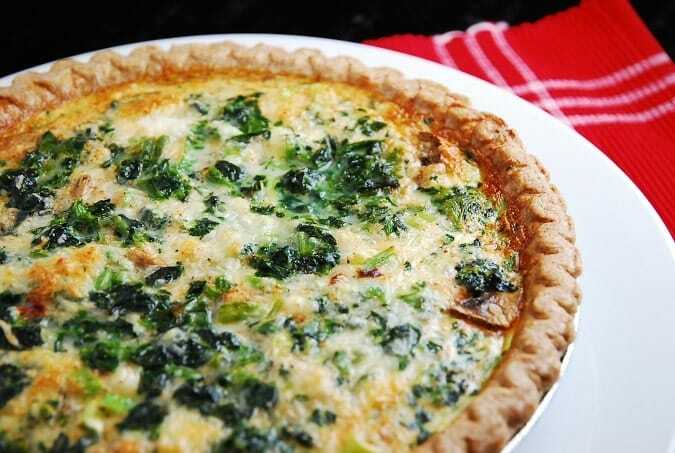 Traditionally, a breakfast dish, but this Weight Watchers Quiche Recipe can be enjoyed at any meal. In a medium sized bowl, whisk together the eggs, milk, salt, pepper, garlic powder and paprika. Place ½ cup cheese on bottom of pie shell. Top with spinach and other vegetables. Now top with remaining cheese. Pour egg mixture over top of everything. Place in oven and bake for about 45 minutes, or until egg is cooked through and is no longer runny. Let set for about 10 minutes before serving. Cut into 8 servings. Do I need to saute the mushrooms first? You don’t need to, but you can if you want. Bet it would be great with a phyllo dough crust too.